Economics is often regarded as pedantic and boring, “the dismal science,” but raging now within the discipline is a dramatic and emotionally-charged debate about its future—and that of humanity. This documentary takes audiences into the heart of the messy and meaningful battle for the soul of economics at a time when nothing short of a revolution in economic thinking will preserve our human experiment here on Planet Earth. A monumental paradigm shift, a century in the making, is now underway in the science of economics. Bionomics—a child of the ecological economics movement of the 20th century—presents a fundamental challenge to the way people comprehend such basic concepts as growth, value and progress. It will redefine the way economics is taught in universities. It will reform the way our affairs are managed by governments. And it will repair the way we think about the future of life on Planet Earth. This revolution in thought traces its roots to a group of economists and thinkers who, as early as 1926, dared challenge the unspoken assumptions of how goods are produced, distributed and consumed—pioneers like Frederick Soddy, Nicholas Georgescu-Roegen, Kenneth Boulding, E. F. Schumacher, Robert Heilbroner and Herman Daly. Stop creating money out of nothing. Anyone who believes exponential growth can go on forever is either a madman or an economist. These theorists’ names will go down in history. Their ideas are as revolutionary to the study of economics as were Copernicus’ to astronomy, Freud’s to psychology and Einstein’s to physics. Before economics can progress, it must abandon its suicidal formalism. Networking over the internet and reaching the media through powerful family connections, the students launched a movement that came to be known as Post-Autistic Economics. It was message with legs, spreading first to Cambridge and then to Harvard; as it did, a detectable chill quivered through the global academic establishment. Theirs was a pivotal moment in the history of economics, whose effects reverberate still. Economics is about people, not curves. The financial meltdown of 2008 caught most academics, policymakers and think tanks by surprise. Somehow, fewer than one in a hundred mainstream economists could see it coming…. WHAT GOOD ARE ECONOMISTS ANYWAY? SWEEP ECONOMISTS OFF THEIR THRONE! HOW TO REBUILD A SHAMED SUBJECT? No scientific discipline has ever suffered such a devastating blow to its credibility. Today, as financial instability feels more the rule than the exception—and with the effects of climate change obvious to all but the most benighted—global citizens are questioning the precepts of economic science as never before. Are all the environmental costs of our way of doing business properly accounted for? Does a product’s price in the global marketplace tell the ecological truth? Is GDP a credible measure of economic progress? Is infinite growth possible on a finite planet? Thomas Kuln laid out the blueprint in 1962, in his legendary work The Structure of Scientific Revolutions. Paradigm shifts are almost always nasty, messy, dirty affairs, he argued. The old guard protects its turf jealously. Dissenters are ignored and stonewalled, refused publication and tenure, ostracized and obstructed at every turn. Obsolete regimes—whether imperial or economic—seldom cede power willingly or graciously. A paradigm isn’t quit because its policies are shown to be broken and its theories unscientific; it gives way in a coup. And that coup—thanks to a group of maverick economists—is upon us now. Kalle Lasn directed a one-hour documentary on the global economy for the National Film Board in 1987. He also directed a series of five half-hour documentaries about Japan for the NFB. Ritual, his first documentary on Japan, was broadcast in the United States, on PBS network. His documentaries have won over a dozen international awards. 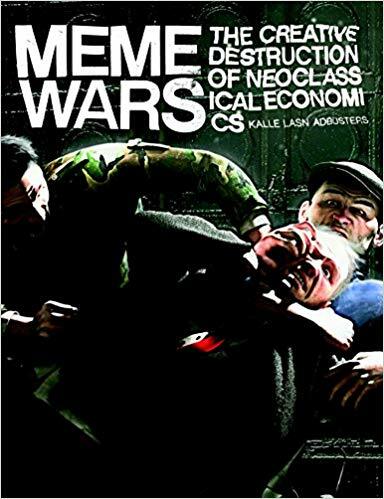 His 2012 book Meme Wars: The Creative Destruction of Neoclassical Economics, was translated into five languages. If this documentary venture resonates with you and you’d like to get involved creatively or help kickstart it financially, then please email kono@adbusters.org or call 1 604 736-9401.